I noticed that our popular local TV food programme naming Ho Chak! had previously featured this place. A restaurant run by two young partners. The two are the chefs of the restaurant as well and the restaurants concept lean towards Chinese Hot Wok Style (Tai Chow). A signature dish of Loong Grill Fish Restaurant, Japanese Escargots presented in crispy shell, top-hat style. It's creamy and cheesy fried with curry leaves and chillies. A delicious combination or cheese with some spicyness. The name of the dish describes it well. A special mixed vege where brocolli, cauliflower,carrot, corn, lotus root, celery, sweet pea, button mushroom fried with asparagus,clams,sliced garlic and fried squid. It's aromaticly fried and definitely a good choice of the day! 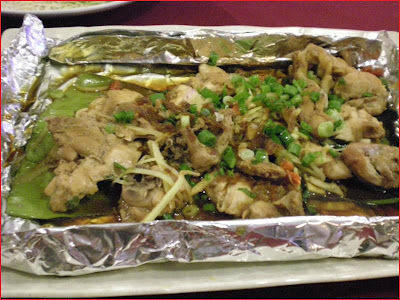 A distinguished dish- Chickens are baked to tender with seasonings, goji berry (gei ji), ginger and topped with fried and spring onions. Tasted good! 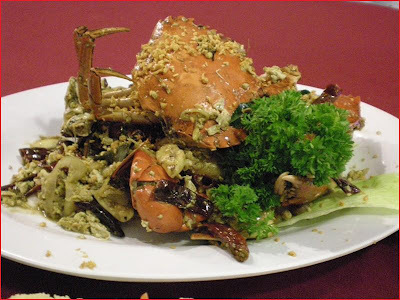 Lastly, here comes the Hong Kong Crabs......mmmmmmmm.......so-so! Perhaps we should go for other cooking style next time. Their most popular crabs dish is the BBQ Crab. Not wanting to try the BBQ style we chosed the Hong Kong Crab which does not pleased me much. As for drinks, I tried "Seven Up" after reading this The Star's Article pasted on the wall. Am not posting pics for the drinks. Bali is an Indonesian island which is also a tourist paradise. Although Balinese culture are strongly predominated by Indian and Chinese culture with influence of the Indonesian lifestyle. Hence, the impact of Balinese cuisine are more likely the mixture of different cultures and it's delicacies are mostly spicy and peppery. Balinese style of satay. Sate lilit are minced mix seafood satay in Lemongrass skewer. The fragrance of the lemongrass skewer absorbs well into minced seafood and grilled to perfection. It's aromatic and delicious tasted abit like otak otak ( not the colour) but it's a bit greasy. Nasi campur (mixed rice) is classic indonesian meal. Basically the meal consist of steamed white rice topped with various meat/seafood. vegetables served with sambal and assortments. Stir fried squid and petai with onions, cili padi, herbs and spice. Generous portion of squids. Tasted good, but too dry without any sauce except sambal. Well marinated fried chicken. Chicken were delicately crispy and huge in portion. All the Balinese flavour are served with Nasi Ubuk for seafood dishes and Nasi Kuning for chicken and lamb dishes with sambal terasi, rempenyek, sauteed kangkungs and other condiments. 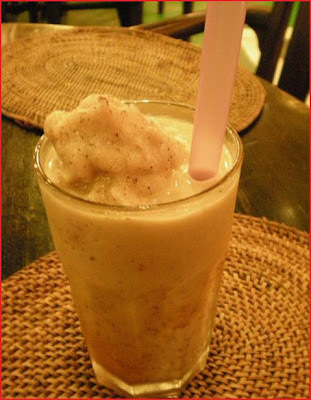 An aunthentic Balinese Ice Blended Pulut Hitam!! 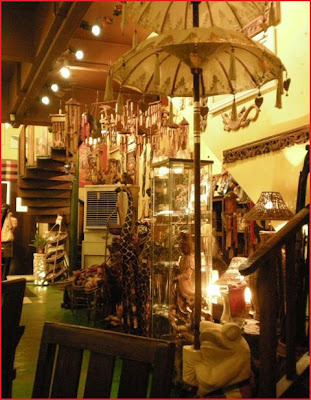 While waiting for food, one can walk around to see the display of decorations sell by Bumbu Bali To taste the essence of Balinese cuisine, Bumbu Bali is a restaurant that you can consider to dine in. Balinese life into a harmonious surrounding will ensure a most memorable and authentic dining experience. BUT, to compare, for me myself, I would prefer Ole Ole Bali. Porridge also known as rice congee is popular among the Asian countries and very often it is considered a food suitable for the unwell as it helps indigestion. It is also taken as an everyday meal. As for me, I don't really fancy congee, as the fullness doesn't last long. But, I do eat congee once in a while especially when I don't feel well. Visited this popular stall in OUG for few consecutive days and it seems that the congee served by fei lou (fatty) is appetizing. The most popular serving would be the claypot gong poh frog and then the claypot ginger and onion fish. The dish are served with plain porridge. It's plain and simple but damn tasty! Dried scallop or more known as conpoy boiled with congee and ginger. It's appetizing and seems nutritious! Frog cooked in claypot with dried chillies, onions, ginger and the seasoning. A flavorsome dish to eat along with the plain congee. Does this looks delicious to you? Fish cooked in claypot with ginger and onions and seasonings. 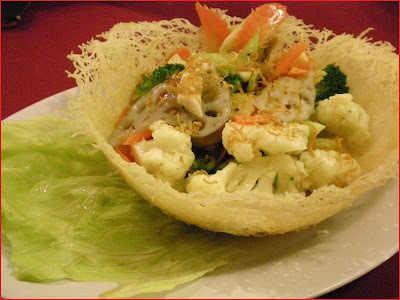 A tasteful and fresh dish to eat along with the congee. Basically, the types of congee served by fei lou are delicious. The congee were boiled till soft and fine and the dishes here are tasteful and appetizing. Do try! The drinks and tapas doesn't please us much. Time took to serve the drinks were too long. Where is our capucinno? As for soup, it's just normal. Nothing much to comment. For delicious tapas, consider Sentidos Tapas @ KL Plaza! Spiced prawn and chicken quesadillas, were served with grilled tortilla (a plain round flour cake) wrapping spiced prawn/ chicken, tomatoes, red beans, jalapeno (chilli pepper) and pineapple. The dish is served with 3sauces which is salsa sauce, sour cream and guacamole (mashed avocado). The chicken quesadillas tasted good with humble portion of grilled chicken wrapped with tortillas but the spiced prawn quesadillas, I can hardly see the prawns. A tasteful spanish dish! Pan fried Cod Fish with zucchini, bell peppers and asparagus served with roasted pimientos sauce and sweet potatoes. Although it's pan fried, the juiciness of the fish is maintained. The tastiness and freshness of the fish makes this dish a highly pleasing one. Marinated chicken grilled to perfection served on hot plate with sauteed onion, bell peppers and vegetables salsa sauce. Together the tortillas, salsa sauce, sout cream and guacamole were served. You may wrap the chicken fajitas with tortillas and sauces. The Chicken Fajitas were well marinated and it's delectable!! For me, a delicious carbonara should be creamy and yet light in taste. This is definitely a satisfying Carbonara I have tried. It's creamy but light in taste, spaghetti served with bacon, mushrooms, grated parmesan cheese and egg yolk. Well, I expected some special Mediterranean cuisine but dishes served by Saffron Mediterranean Bistro were just some normal dishes. I guess Mediterranean cuisine means the cuisines from different countries surrounding the Mediterannean Sea. For a restaurant which is classified as fine dining, the food qualities were considered average but satisfying but could be much better. Maybe, it's still very new......Work harder ya!! Most of the time, I am too lazy to travel to KL for food especially during weekends. Well, I travel to the golden triangle to work from Monday to Friday and if it is during the weekends, I would prefer somewhere other than Kuala Lumpur!! This is different this time, it's because I was craving for nasi lemak and I recalled this stall which we often called it San Peng Nasi Lemak. San Peng is not the person who sells Nasi Lemak, it's the name of the road Jalan San Peng and it so happened that the stall famous at this area, and they named it San Peng Nasi Lemak. San Peng Nasi Lemak operates from 8.30 pm- 2.30 am from Monday to Saturday, closes on Sunday. It's always crowded around 10.00 pm and during midnights.vIt's sort of difficult to locate this stall due to it's location but I guess people around Jalan Loke Yew area might be able to help you if you are asking for direction. Talking about fast food, I guess most Malaysian would have Mc Donalds, KFC and Pizza Hut in mind. In the 1990's, Carl's Jr were introduced to the Malaysians with their outlets whichwere located in Masjid Jamek Ampang and Lake Garden, Kuala Lumpur but the response were poor and the outlet were closed in 1998. In year 2007, once again Carl's Junior entered into Malaysian market with 4 new outlets in Kuala Lumpur Malaysia. Carl's Jr. is an fast food restaurant chain that serves charbroiled burgers. Carl's Jr. is an fast food restaurant chain that serves charbroiled burgers. It is ranked as the 4th QSR burger chain in United States after Mc Donalds, Burger King and Wendy's. Carl's Jr. was fouded in 1941 by Carl B Karcher who initially started his business by owning several hot dog stands in Los Angeles. From there, the business expanded and it is a world wide known fast food reataurant now. Charbroil means cooking the food ie meat, fish or vegetables on a steel grid surface with fire below, which then when the food is cook, there are burned "lines" on the food. Which means, cooking the meat to well done without drying out the meat. I ordered the Charbroiled Chicken Club which is served with chicken meat cook to well done and tender, chicken bacons, cheese and vegetables. To add on, there are onions, sauce and pickles like olive and cucumber etc which is available at the refillable drink counters. She tell you size doesn't matter. She's lying. Another own specialty of Sitiawan would be their Kan Pua Noodles which is similar to our Wan Tan Noodles. Wan Tan Noodles is a Cantonese Noodles dish. The noodles dish is served with roasted pork (char siew) and wan tan/ won ton which is a minced pork/prawns dumplings. This noodles dish are normally serve in soup, but you can opt for the dry version where the bowl of wan tan soup is served seperately. A plate of noodles with traces of dark soy sauce gravy. The noodles are cooked with care to avoid over cooking and the texture of the firm noodles are definitely telling you that it is a freshly hand made top quality noodles. The noodles are done just nice and springy and is topped with roasted pork. Add on sambal's provided if you like it to be spicy. We ordered a bowl of wan tan soup (pork dumplings) and the wan tan were delicous. Not too much of pork but well marinated and wrap with thin wan tan skin.The wan tans are slippery and can be simply slurped down. Deliciuos! Almost all of the chinese coffee shop in Sitiawan serve Kan Pua Noodles. I personally think this is one of the good one as I have tried a few different stalls earlier.Do try!! If we mention about Cendol, one will be either talk about the cendol in Penang or Malacca. Well...well......Sitiawan too has it's own version of Cendol. Cendol is a dessert comprising shaved ice, fragant green rice noodles in coconut milk and palm syrup. The noodles are mixed with coconut milk and the mixture is ladled over a bowl of shaved ice which is the topped with palm syrup. Toppings include stewed red beans, sweet corns or jelly. This is not the most famous stall in Sitiawan. They said the one which is famous is the stall where the sellers are with white uniforms operating near The Store supermarket. But, it is not operating on the day of my visit. So, I tried the cendol by this stall which is operating in front of Wisma Ganda. Cendol is not a Fu Zhou dish huh~lol~ This is another version of cendol which is served with glutinous rice. Taste wise is normal, I guess it is because of the glutinous rice served with the dessert that makes it abit more special. The texture of the rice noodles were springy, soft and slippery.It's a simple yet delightful dessert especially during this hot climate. 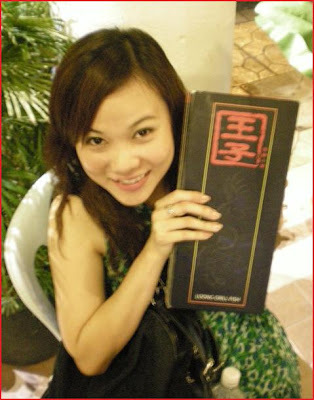 Sitiawan is identified with the Fu Zhou(Hock Chew) heritage. It's believe that most settlement of the industrious migrants were mostly from Ku tien, Fu Zhou, China. Hence, this small town is famous with it's own local heritage Fu Zhou (Hock Chew) dishes. If you ask the locals, what are their famous delicacies, they would have recommend you "Gong Pian" which is the savoury biscuits that we can only find it in this small town where the original recipe were brought by the Fu zhou settlers from China. Gong Pian is a clay oven baked biscuits stuffed with fillings like char siew(roasted pork) & slightly salted fried onions. The savory biscuits recipe were brought in by the early Hock Chew settlers from China. Cheong Cia Gong Pian business was taken over by two brothers from their granduncle about 10years ago and the old family business is doing very well. I guess that is the reason that makes the owner of the business being so snobbish. Despite of their behaviour, you will still see patrons lining up to order their famous gong pian. The process of making gong pian is time consuming and tedious. Cheong Cia produces at least 1000 pieces of biscuits a day. And it's not surprising that you will see customer ordering up to hundred biscuits to take back home and at the end of the day, every single biscuit is sold out! If you happen to pass by Sitiawan or if you are in Sitiawan, never miss the gong pian- dry biscuits as it is only available in this town. Something special that you should try! I have heard about the best roti canai stall that is operating by the river side in Kampung Sitiawan. So, I requested a visit early in the morning. Roti Canai is a type of flat bread found in Malaysia and this dish is believed to be originated from Chennai, India(formerly known as Madras). The word "roti" means bread in Hindu and Malay and the word "canai" is believed to derived from the word Chennai but in Malay, "canai" means "to flatten". 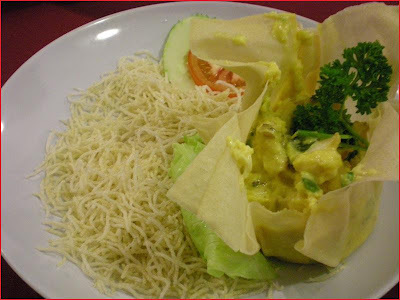 So, the how the derivation of the name and meaning of the dish, Roti Canai is still ambiguous. Roti Canai is often sold in mamak stalls and it is known as Roti Prata in Singapore. The name Roti Prata has another history background too. I was welcomed with a number of flies. The roti kosong and roti telur were grilled to crispy with margarine and it's aromatic. If the number of flies were lesser, I would have stayed a little big longer to try the other foods like nasi lemak and fried vermicelli. Unfortunately, I was too irritated with the flies that keep surrounding the tables and lingering at my legs. If, you are not a local, it would be a bit tough for you to locate this area. If I am not mistaken, there are two resorts operating in this village. I can't remember the resorts name by now. Could probably ask the locals for directions. It's crowded and be there early if you wanna try! I don't know the name of the street, as far as the locals can tell me, it's behind KFC of Sitiawan and opposite the wet market. How can someone staying in Sitiawan doesn't know the name of this place huh??? That's fine....as long as I am here to try the charcoal fried kuey tiow/ char kuey tiow. Char Kway Teow means fried flat noodles. It is a popular noodle dish particularly in Penang, Malaysia and Singapore. The dish and ingredients are quite basic, essentially being flat noodle fried with smattering prawns and cockles with an egg added to taste and portion of bean sprouts thrown in just when the dish is done. The well control heat plus the ingredients and seasonings gives the noodle its fragrance. The char kway teow looks ordinary but the taste is indeed good and this stall is obviously one of the famous stall in Sitiawan. Bidor is a small town located between Ipoh and Kuala Lumpur, which is a district of Batang Padang,Perak, Malaysia. The most famous food will be the herbal duck thigh noodles by one of the eatery naming Pun Chun Chicken Biscuit & Restaurant Sdn. Bhd. This restaurant has been operating for about 70 years and is located at the one and only main street of Bidor known as Jalan Besar. Besides Herbal Duck Thigh Noodles, Pun Chun is also famous with their sweet snacks which is Sai Mat Kai & Kai Jai Peng (chicken Biscuit). Duck thigh noodles are served in herbal soup topped with duck thigh which its’ is soft and tender and springy wan tan noodles in a big bowl. A sip of the soup and you will know why this restaurant has become a favorite spot of the locals and tourist as well. The ingredient used includes dried longan, ginger, goji berry (gei ji) , yu zhu (sealroot). Plus the culinary skills in preparing the duck thigh herbal soup, I guess that is why the rich broth is aromatic, sweet and tasty. The gon-lo/ dry version of noodles are served with Shujin’s Duck Soup which is the herbal soup is served with one duck thigh. Taste wise, the soup tasted the same as the Herbal Thigh Noodle. You may order the soup separately as well. Now, I know why my sister highly recomended Pun Chun as each time when she goes back to her husband's hometown, she will mentioned it to me! The waiting time for food serve at Pun Chun is lengthy, even it is a normal old looking coffee shop (restaurant), it is all justified by their delicious food. If you happen to travel to the North, do stop by and have a delicious bowl of Herbal Duck Thigh Noodles! By the way…. Pun Chun is also a blogger! Hahahahaha…. I have tried their pork noodles few years back but it is not of my liking. I was flipping one of the old magazine and saw reviews for this stall and decided to revisit for their seafood noodles this time. The seafood noodle is served with a light but tasty soup and generous portion of seafood. I think the essential part of the Pork Noodles served by this stall is the soup which is a rich broth made of minced and filleted pork cooked in a pork stock. The noodles dish is normally served in soup but you can opt for the dry(kon-lo) style, where the noodles is tossed with soy sauce and the soup will be served separately. Although parking is a pain, you will see people lining up to order for their noodle dish which is obvious that the pork and seafood noodles serve by this stall is worthy!